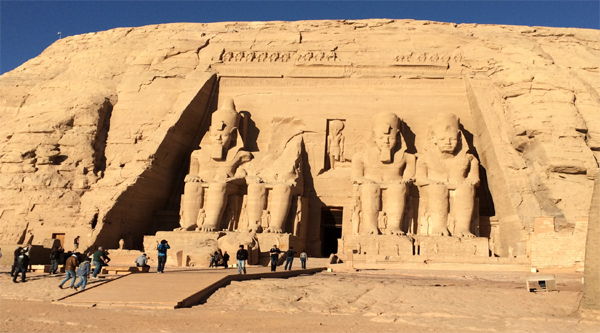 The Great Abu Simbel temple. Nefertari temple at Abu Simbel. Ramses II temple at Abu Simble during Sound & Light show. Temple of Nefertari at Abu Simble. Sound & Light show at Abu Simble. Evening excursion to Abu Simble to watch Sound & Light show. The temples of Abu Simbel are situated in the Nubian territory, 280 km south of Aswan, 210 km south of Tropic of Cancer & 70 km north of the Sudan border. 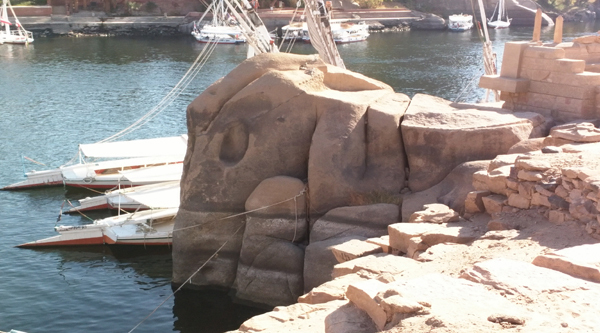 They were cut out of a solid rock on the west bank of the Nile in a position which receives the 1st rays of the god Ra. With time the temples were covered with sand and remained hidden until 22nd March 1813 when a Swiss explore Johann Ludwig Burkardt discovered them. However the 1st person to explore them was Italian Giovanni Battista Belzoni in 1817. The facade of the temple is the only one of its kind with four colossal statues 20 meters in height, depicting the Pharaoh Ramses II seated on his throne. At the sides of each statue there are 2 figures of lesser dimension representing his mother and favorite wife Nefertiti. Between the legs are some of his children. Up the facade you can discover 14 statues of baboons crowing the pedimont. Originally there were 22 statues according to the number of provinces in Upper Egypt. The head of the 2nd statue on the left is lying on the ground, most probably it fell many centuries ago due to the different quality of stone in this part of the mountain or due to a violent earthquake which hit Egypt in 27 BC. When the head fell it destroyed some statues of the Pharaoh and one of the Falcon god, which in turn demolished the temple's terrace, though the northern terrace is still in a good state. And this is the only part of the complex that was built & not cut out of the rock. The sanctuary of the temple has a block of granite on which the sacred boat of the god Amon was placed during rituals. The chamber was constructed with great architectural mastery & skill. On February 21st, the Pharaoh's birthday & October 21st - the anniversary of the Pharaoh's coronation - the first beams of sunlight penetrated the inside of the temple and ran along its length (54 meters), finally reaching the sanctuary where it shone on the face of the King. When the temple was moved to another place during the rescue operation at Abu Simble, the temple was raised 64 meters and the phenomenon has now been delayed one day. Now sun illuminates the face of Ramses II on February 22 & October 22. The temple of Nefertari is situated 100 or so meters north of the great temple and is cut out of the same mountain rock. It was dedicated to the goddess Hathor & to the Queen Nefertari, who was worshiped as a goddess. The temple is 12 metres high & 28 meters wide is decorated with 6 ten meters high statues, in high-relief, which are situated in the niches. Abu Simble temple was reconstructed on a new place before the High dam was launched. In 1960 a project presented by a Stockholm company of Consulting Engineers was chosen as the most feasible & least costly. The idea was to saw the temple in to transportable blocks & place them safely above the water level until they could be rebuilt 64 metres above the original site. The sawing of the temple into over thousand transportable pieces, some weighing as much as fifteen tons, was not easy task. The project was completed in December 1968. The monuments were cut into 1106 blocks (870 the Great temple, 236 the Small Temple) weighing from 7 to 30 tons each. From February 1966 to September 1968, both temples were taken down and rebuilt 64 meters higher up and 180 meters back from the original position, facing west, keeping the same angle and the same inclination as before.